Westlife UK: Is Westlife worth the long wait? Is Westlife worth the long wait? WESTLIFE’s dream of sharing the stage and singing together with Manny Pacquaio during their Gravity Tour 2011 concert held at the Araneta Coliseum on Sept. 29 never came true. Not that the boxing champ snubbed the Irish boy band because of the “informal invitation.” Pacquaio is set to fight against Juan Manuel Marquez come Nov. 12 and so his coach, Freddie Roach, did not allow him to get out of the training camp in Baguio. Aside from the Westlife lads, who else needs the presence of our “Pambansang Kamao” in that concert anyway? Minus Manny, the Irish pop sensation composed of Shane Filan, Kian Egan, Nicky Byrne and Mark Feehily could still whip the crowd into frenzy, effortlessly! And that’s what exactly happened last Thursday night: Westlife showed A1, Boyzone, Backstreet Boys, Blue, F4 and all other foreign boy bands that stepped into the Philippine soil in previous years just how it’s done—and what has brought them such longevity o n the global music scene. Since ABS-CBN was the official TV network partner of the Irish quartet’s Philippine tour, it tapped budding Star Magic talents as front acts: Young JV, Van Roxas and Piero Vergara. But whoever thought of assigning these still-nameless performers as “appetizers” for the show should be reprimanded because they did not start the “meal” off on a delicious note, with their so-so RnB, pop and rap acts that irritated majority of the audience at the Big Dome. It would have been better if the Kapamilya station just utilized one artist who could guarantee better routines like Yeng Constantino, Angeline Quinto or Marie Dibgy. In short, the front acts’ segment was “very Asap Rocks” (read: boring). Deafening applause and screams from adoring fans broke loose shortly after the white curtain dropped and Shane, Kian, Nicky and Mark appeared on stage then belted out “When You’re Looking Like That,” “World of Our Own” and “What Makes a Man.” All of them are in their ‘30s now, but they hardly looked any older. The opening number was too reminiscent of their past concerts archived on DVDs—the lads were clad in black trench coats as usual—but it was clear they haven’t lost their passion to perform for more than 13 years now. The Irish group’s second set, which included “Safe,” “Home”—a Michael Buble original—“Beautiful Tonight”—which sounds like Bruno Mars’ “Just The Way You Are”—was the least-liked segment among the elder devotees as some of them had lost track of Westlife’s most recent albums by now. But this was the part where they extended their huge thank yous to everyone in attendance at the Big Dome. “You are the most enthusiastic crowd I’ve ever seen,” Filan revealed, while Egan said, “Sorry, we left you for so long. Let us bring some old songs back… Are you familiar with the song “My Love?” The fans were made to sing a few lines in a capella, to which Egan and Byrne recorded through their camera phones. In the absence of Pacquiao, the boy band chose four fans that carried attention-grabbing banners—“Nicky, I want twins, can I have your genes?,” “Kian, is it hot in here, or is it just you?” and “Christine Loves Shane”—and were asked to go up on stage to sing “Beautiful Tonight” with them. And the greatest upset among the female fans that night? Oh well, the openly-gay Feehily picked another gay man with “Mark, Kiss Me, It’s My Birthday!” banner to join him on stage! For their third set, Westlife ditched their usual suits for colorful jackets, Mickey Mouse shirts and jeans, then rocked out with the crowd with their versions of Coldplay’s “Viva La Vida,” Black Eyed Peas “Time of My Life (Dirty Bit)” and Lady Gaga’s “Bad Romance.” This type of medley has become a popular staple of the four piece’s most recent shows, and their Manila concert was no exception. But who would forget Feehily’s powerful rendition of Rihanna’s “Only Girl (In The World)?” Not only did it showcase his full vocal range and great potential as a solo artist—it left everyone with their mouths wide open after his astounding performance! “You Raise Me Up,” a song which has been covered more than 125 times, brought the curtain down that evening along with ear-splitting applause. Surprisingly, the Irish boy band did not include in their set list some significant songs that propelled them to stardom: “Swear It Again,” their first-ever UK no. 1 single, and “Fool Again,” their fifth consecutive UK chart-topper. 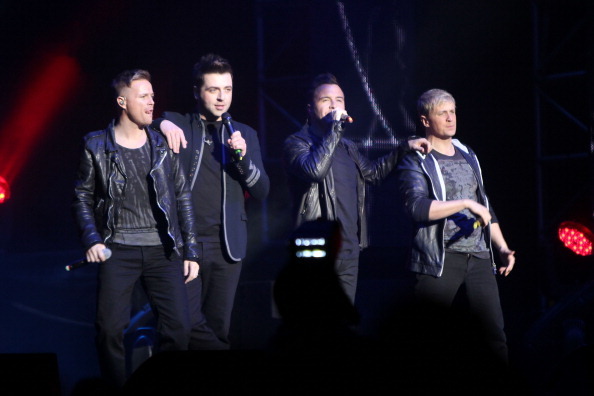 Gravity Tour 2011 marked Westlife’s fourth visit to Manila, the previous ones were back in 2000, 2001 and 2006. But with an estimated number of 11,000 people who trooped the Araneta Coliseum to see them face to face, it appeared like it was only their first time to come here! The Gravity Tour 2011 concert was magnificent as it showed how much Shane Filan, Kian Egan, Nicky Byrne and Mark Feehily evolved from being a stereotype boy band to a live-performance act. The Irish quartet has gone so far to become a mature vocal group packed with tightly-knit harmonies and easy grace on stage. With a couple of new arrangements for some of their previous hits, they were able to make attendees at the Big Dome feel that they were hearing several songs for the first time. That’s quite an achievement in itself. Westlife’s Manila tour was indeed worth the long wait.